Warm Welcome to Jane Layton! ​LLCT is delighted to welcome Jane Layton as our new Stewardship Coordinator! Jane recently retired as the Town Ranger for Lincoln’s Conservation Department after more than 29 years. She is also a professional artist whose bird carvings have won regional and world competition awards. Her birds are found in collections worldwide and her work can be viewed here. 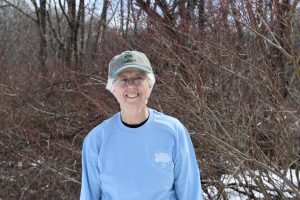 When not on Lincoln’s trails, Jane can be found hiking all over New England. 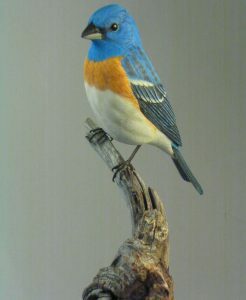 Lazuli Bunting carved and painted by Jane Layton. New Garlic Mustard Pull Video Series: Watch Now!